When a child is conceived and two people rejoice, images and hopes of what life will be like begin to blossom in their minds. And if, tragically, the pregnancy isn’t viable and the child is lost, the parents mourn. In America, our culture still seems unsure on how to mourn or indeed how to even acknowledge miscarriage. Women may be embattled with feelings of how much grieving is “appropriate” or wonder why they can’t seem to move on. It’s a strange phenomenon really. The privacy that generally clouds miscarriages is something that I theorize to be an ironic blend of early Victorian sensibilities and the modern attitudes toward abortion. Don’t talk about it. Don’t make people uncomfortable. Was it really an actual child of yours anyway? This is just my theory but I wonder what society would be like if we felt comfortable talking about miscarriage and maybe how that might impact the abortion industry. 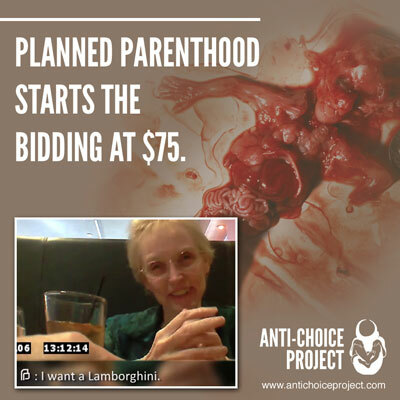 There is a lot of leftover buzz from the Planned Parenthood videos still. The 10th video was recently released and popular bloggers like Matt Walsh are despairing over the lack of attention the videos are getting. His anger is justified; it’s frustrating beyond compare to have such a damning, clear-cut case against the public funding of Planned Parenthood pass by with little more than a flutter on social media. Sure the conservatives are doing their part: urging action and prayer and protests. But they too, have lost steam, since the first video came out. Who can blame them? 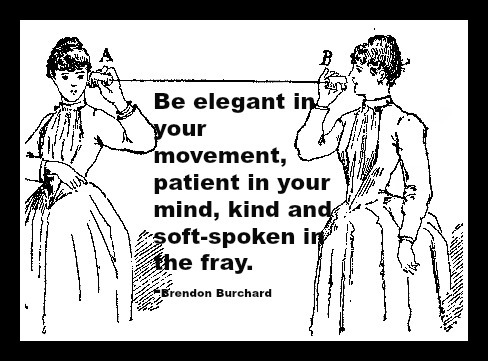 You can only throw pearls before swine for so long before you lose heart and realize your efforts are in vain. I think the more pressing issue we can take from this is that this whole experience proves something obvious that seems to be overlooked: people aren’t changing their opinion on Planned Parenthood because people are choosing not to watch the videos. It’s much easier to scroll right past anything that might challenge their beloved, iron-clad faith in the abortion industry and in the “good” that Planned Parenthood does (which has largely been debunked too, but hey, who’s paying attention to facts these days?). We wonder why people are ignoring what happened but the answer is crystal clear that they are ignoring it because they can. Social media is a powerful weapon but it comes with a an equally powerful defense mechanism called the delete button, the scroll down, and the ‘unfollow’ option. In short, you can look away and turn it off. 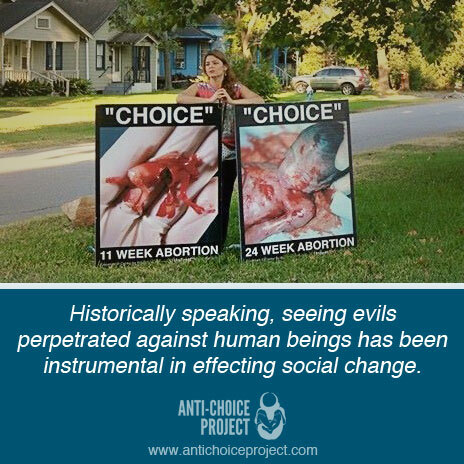 People will continue to be apathetic toward abortion exposés so long as they have the option to ignore them. For all those die hard pro-lifers who were hoping and praying that these videos would soften the hearts of a callous nation, I am truly sorry. I hate to admit that I, for one, am not surprised. My hope however, is that the need becomes even more clear to support public imagery of abortion that can’t be ignored or trivialized. We want to stop this horrifying slaughter of innocent human lives. We want the holocaust to end. For that to happen, the reality has to be looked at dead on. Signs waiting for you at a stoplight can’t be clicked away from, can’t be scrolled past. We can do our best to ignore them, to pretend not to see them. But the drivers are all keenly aware that they are there and that they are crying out to be seen and justice is begging to take place. Despite all the good and power of social media, real life confrontation and witness still offers the most effective way to combat abortion. The following is from our quarterly newsletter. You can be among the first to receive our printed newsletter and see previous issues here. 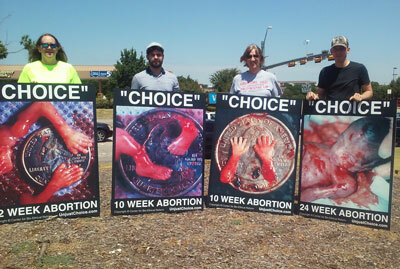 Colby Sims (right), with volunteers at the first ACP abortion photo display in Dallas, Texas on August 1, 2015. 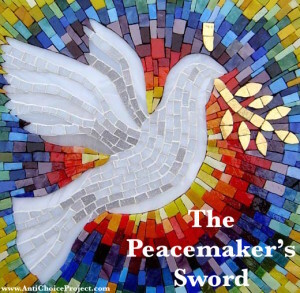 On June 1, 2015, we received an ACP chapter application from Colby Sims of Dallas, Texas. Colby is a pro-life activist who felt the calling to become more involved in exposing the evil of abortion. After getting to know Colby over the next few weeks, we determined he would be a great fit as a chapter director in Dallas and shipped him 8 abortion victim signs and a security camera! We are very excited to have Colby join our team and add Dallas to the ever-growing list of U.S. cities in which the disturbing truth of abortion will be exposed. It’s been 5 weeks since the Planned Parenthood video investigation scandal first broke. My heart is heavy and I’ve been spending much of this past month trying to collect my thoughts. I feel a mix of disgust and anger and horror and relief. Relief that this darkness is being brought to light. It’s quite a bit to process: I feel like we are standing inside one of those pivotal moments in history and yet I feel completely inadequate and inert. I think part of my problem is that I’m overwhelmed by all of the nonstop information about the investigation. Every time I open any social media account there’s a new article, a fresh angle, a new video, and on and on and on. I check out blogs or open the newspaper and there are new talking points and viewpoints and opinion polls and infographics and hash tags. And everyone is trying to say all the things that need to be said. And I’ve got nothing new to say. I just can’t keep up with all the zings and truth bombs and clever memes and creative analogies and smart arguments and all the words. It’s moving so fast and the conversation keeps shifting and to be honest it leaves me numb and paralyzed. Not because I am apathetic but because I care so much. And because I’m scared. This battle has really just begun. Is something really going to change? It has to. It just has to. But then I read the words of pro-choicers and fence-sitters and it feels like the same old volleying back and forth of attacks and rebuttals. I naively thought that something like this, videos revealing the evil and reality of abortion, would make it impossible to skirt around what is really going on. But we’ve got plenty of skirting; of trying to change the subject. Babies are being cut up and sold for profit and we have people talking about finding a compromise or how joblessness should be as equally upsetting. Are you kidding me? And it makes me wonder, are hearts really going to be changed by a witty political cartoon? Do people really stop and think? Or do they just consume the information, scroll past the articles, and move on, hungry for more. Is this really going to be our Wilberforce moment? Are these little babies our Emmett Till? Oh, please Lord, let this be the moment we’ve been waiting for – let this be the pivotal moment in this fight against abortion. I can’t sit frozen on the side lines. If we want this to be a turning point, we’re all going to have to do our part. Even if I don’t have any new thoughts or fancy infographics or creative memes, I can still do something, I can keep fighting this worthy fight in my own small way. Remember that these videos show real people. It’s so easy for me to forget that these are videos are not just a tactic in this battle for life. They not just something to use, to “like” and consume. These videos show very real babies. But they also show other people – real people with dignity and worth. 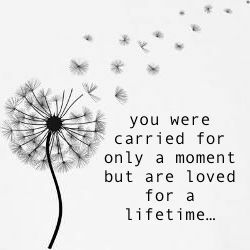 People like the doctors and procurement technicians and researchers and the mamas and the dads, who have wounds deep down in their souls, whether they know it or not. Fast and pray for our country, for our lawmakers, for those who have see the videos and are still blind to evils of abortion, for all those who are involved with this kind of work, for anyone who has had an abortion, for anyone has been hurt by the lies and deception of Planned Parenthood. Financially support a mama who chose life for her sweet baby. Protest Planned Parenthood and stand unified with others who fighting this battle for equal rights for all humans. What about you? How do you plan on fighting this worthy fight? 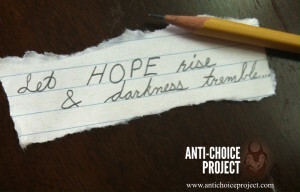 I don’t love the Anti-Choice Project. It makes me uncomfortable. I can’t look at the images and not feel sick to my stomach. I hurt for the abortion victims shown. I hurt for the women driving by the signs who’ve had abortions or experienced miscarriages. And I hurt most of all for the children who see these pictures and unwillingly experience a slight loss to their childhood. The world isn’t all smiley faces and butterflies after all… and I ache for their innocence lost. When asked to write for this group, I hesitated. In junior college, I stood by the Center for Bio-Ethical Reform with pride. I felt confident that the signs we were displaying on college campuses were good and right; the audience was perfect and children were not exposed. But ACP was different. They were out there out on street corners — in public places. This was just outside of my comfort level. So I consulted a few close friends. I was worried about associating myself with a group that I wasn’t sure I supported 100%. I wondered if it somehow made me inconsistent with my ethical code and questioned whether or not I’d be embarrassed to link to articles I’ve written. Obviously, I concluded that writing for the group would be okay. They simply asked me not to say anything disparaging regarding graphic imagery in posts while otherwise giving me free reign. I could handle that. Still, I didn’t expect my personal feelings on the matter to change. Don’t give up. We need you. You are not alone. I know how disillusioned you must feel sometimes. 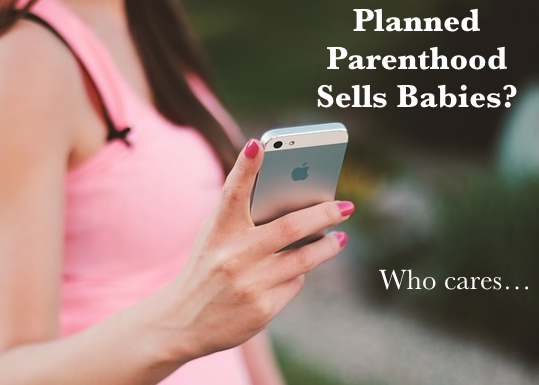 Stories about Planned Parenthood selling aborted baby parts are just the latest in a long assault against life. It’s disheartening, I know. You’re angry that the story is only receiving minimal attention (and from mostly conservative sources) while social media is abuzz over what Caitlyn Jenner wore to the ESPY awards. But your frustration isn’t in vain. The culture can still wake up. Knowledge can still do its work. People can still change. The other day, I made a comment on Facebook that I thought was fair in a very calm, and respectful political discussion. I remarked that I couldn’t vote for candidates that promote or accept abortion because they are either ignorant of science, spineless (okay, okay… I should’ve used the less offensive “easily influenced”) or ethically disordered. In the social media coliseum, I am very careful in choosing my words because I know how quickly the unseen mob can rush in to attack and flay you on any loose word. So I tread carefully but honestly and thought my comments were not nearly as inflammatory as they could’ve been. This morning I took all of my children to the doctor’s office for my oldest son’s well-child appointment. They were as quiet and respectful as is humanly possible for 5 boys under 10 years old, and so I decided to treat them with a trip to a nearby park. The only problem: I had no idea how to get there. I made my best guess and turned onto a road that I had never been on before. I pulled up to a stop sign and waited for the traffic to clear so that I could drive through the intersection. I waited for the cars to drive past. But they stopped also. I thought it was weird that they were stopping, so I took a second to look around. Did someone just run out into the road? It took a moment for it to register that, no, they were waiting for me. I realized that I was at a 4-way-stop, and the other cars had also stopped at their stop sign. I had the right-of-way and didn’t know it. It was obvious that the other drivers knew the rules of this road. A woman in one of the cars was very upset with me and my ignorance. And she expressed her frustration in all kinds of fun ways – some yelling, some horn honking, some dramatic PG-13 gestures. America is not a pro-war country. Our people are patriots. But we have grown an increasing rejection of preventable warfare. And one of the reasons for this is because of an interesting development in warfare information: Imbedded journalism. The invasion of Iraq in 2003 is really the kickstart of what has now become commonplace— reporters and photographers today, are expected to give the public a full view of the reality of war. This, combined with more and more realistic movies churned out by Hollywood, has been a turning point in how comfortable the American people are with war. Nobody likes war. Nobody wants war. And the cultural resistance to unnecessary bloodshed has only grown stronger. No longer is it just progressive hippies demanding peace as in the Vietnam War era… now the sentiment of patriotism has grown beyond waving flags and hanging yellow ribbons and holding parades for returning combatants. American patriots today are comfortable saying that they don’t want any more war. Conservative politicians aren’t bragging about defense budgets any more and aren’t exactly riding around in tanks with a cigar hanging out of their mouths. Today, we mourn our losses with a rising fervor. America is fed up with war. And I think this is largely because the visual component of our brains have access to much more information today than we did even 15 years ago. We had to see it to believe it. Speaking on the decision to embed journalists during the Iraqi War, Lt. Col. Rick Long is quoted as saying “Frankly, our job is to win the war. 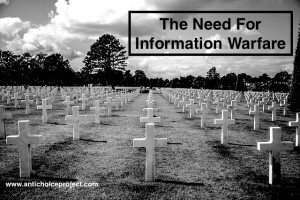 Part of that is information warfare. 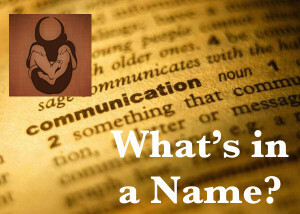 So we are going to attempt to dominate the information environment.” No longer are casualties just names in the newspaper or battles just glorified on propaganda posters. The horror is real. And the graphics are waking us up to a fairly young but surprisingly collective intolerance for war. In the same way, it seems important to realize that all the small but significant strides the pro-life movement has made in limiting abortions is 100% due to information: the science behind viability, fetal pain understanding, ultrasound technology. There is some discomfort or downright repulsion in seeing images of aborted children. Yet we have to show the true face of abortion so the killing can no longer hide behind the smoke and mirrors of “women’s rights.” Images of torture and dead bodies have proven to work for building a resistance to war for our people. 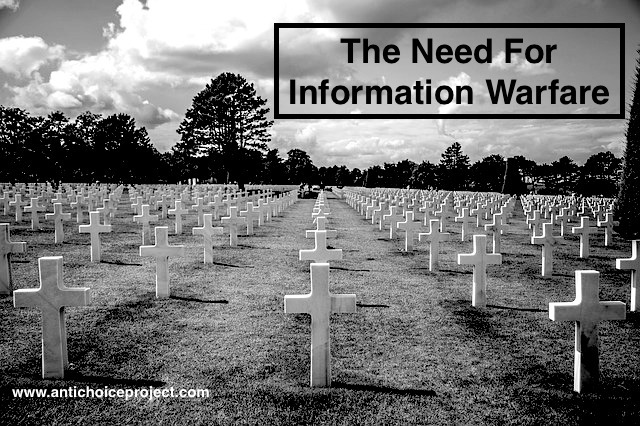 So it seems clear that in order to sensitize the public toward the value of unborn lives, information warfare is a tactic in which we have to engage. This Memorial Day, I respectfully remember those who’ve given their lives in service to their country. And I am thankful that the public is becoming more and more aware of the heavy price our nation pays every time we make the decision to engage in warfare. We demand accountability. We will protect our independence but we expect there to be a serious and just reason to risk the lives of our soldiers. Images have helped shape our realization of war’s heavy expense. And I pray that the American people will also recoil in horror at the visuals of abortion. I am uncomfortable with it; we all should be. Yet, I want the information out there. I want the destruction of lives to stop. This month abortion advocates were dismayed when North Carolina House Bill 465 narrowly passed— a bill which mandates a 72 hour waiting period for women seeking abortions. Included in the bill’s language is the allowance for the state’s medical students to not be forced to learn or observe how to perform an abortion. The protests have been thundering through the online world and a disturbing trend of the Pro-Choice lobby is made more clear than ever.